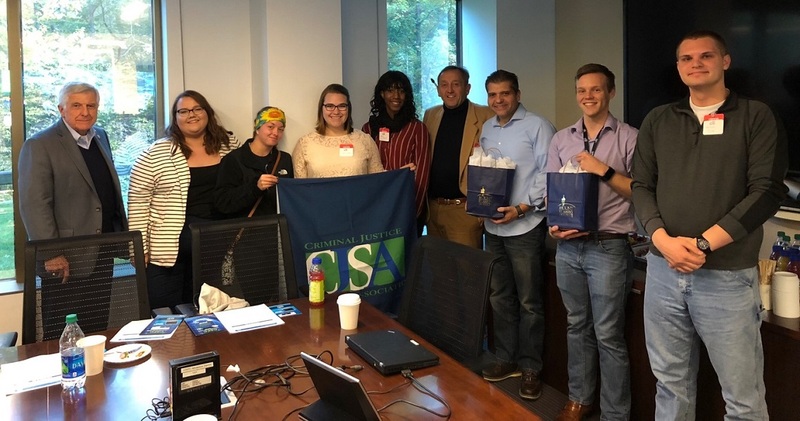 From left to right are Professor Joseph Vince, Kelly Marjarum, Lida Fitz, Sydney Johnson, Kyrsten Peterson, Chief Transformation Officer Simon Blackwell, Citi Senior Vice President John Galluzzo, Citi Assistant Vice President Sam Pechar and Matthew Nield. Criminal justice and forensic accounting students toured Citigroup’s Cyber Security Fusion Center (CSFC) in Warren, New Jersey on October 26, gaining the opportunity to experience a real-world operation involving the use of data analytics, cyber security, and intelligence analysis. Kyrsten Peterson, Matthew Nield, Sydney Johnson, Lida Fitz, and Kelly Marjarum were accompanied by Professor Joseph Vince and Chief Transformation Officer Simon Blackwell. Thomas J. Harrington III, C’78, the corporate executive and designer behind the creation of the Center, arranged the visit. The tour began with a CITI Intelligence-led video and an oral presentation by John Galluzzo, senior vice president of CSFC Global Core Functions and Client Engagements. The video provided an overview of the Center’s 15 teams, their global connections and their mission to lessen cyber-attacks against Citigroup and its clientele’s assets. Upon completion of the presentation, students observed the Center’s live “Daily Brief Call” monitored from strategic locations around the world. This daily meeting is the time when all Center teams give a quick account of their findings from the last 24 hours and explain their activities and monitored actions. The most notable aspect of CSFC’s work space was a large wall lined with 36 monitors that graphically displays real-time information. Each monitor showcases particular relevant data that can be viewed by Center staff. The data displayed is from open-sourced data collections, CITI specific research products and news outlets spanning the globe. The wall allows CITI supervisors and managers to quickly analyze with a trained eye mass amounts of information during threat incidents ranging from moderate attacks to a crisis event. The CSFC also has the capability to continuously scrutinize internet activity. If something is criminally occurring on the World Wide Web, then it is likely that such criminality will also affect CITI’s online activities, Citi staff explained to students. The students’ favorite part of the tour was a spear phishing malware demonstration. Senior Vice President John Galluzzo had two employees demonstrate a live attack by a hacker, with one employee posing as the phishing victim and the other as the “bad guy hacker.” In the enacted scenario, an employee of Citi emailed confidential documents to his personal email, effectively taking away all of Citi’s cybersecurity protocols. The hacker was hired to receive these documents from the computer relating to the negotiations of a major purchase. The hacker was shown to easily accomplish ‘the hack’ by emailing a fake Google email claiming a password change was needed. As soon as the link was connected in the email, the hacker had full access to the entire computer and was easily able to access every piece of valuable information, including access to the victim’s computer camera. “I thought the demonstration at the end really pulled everything together and made it clear how important their jobs are, especially in today’s world,” said Lida Fitz, C’22. Students left the CITI Center realizing the important role that intelligence analysts and cybersecurity specialist play in keeping our country and corporate America safe from internet intrusion. The students went away with a desire to pursue careers in the field of intelligence and cybersecurity.